INTJ personality types think strategically and see the big picture. This introduction to the INTJ personality type, based on the Myers-Briggs® Step I personality assessment, can help INTJs to understand how they interact with others, and what careers they might enjoy. INTJ people are often able to define a compelling, long-range vision, and can devise innovative solutions to complex problems. INTJs may come across as cold and distant when focusing on the task in hand. They can neglect to recognise and appreciate the contributions of others. INTJs are typically strategic and conceptual as well as innovative, independent and logical. They can also be demanding and but reflective. Their most common characteristics are shown here in the form of a fun Typie, which you can download and share. 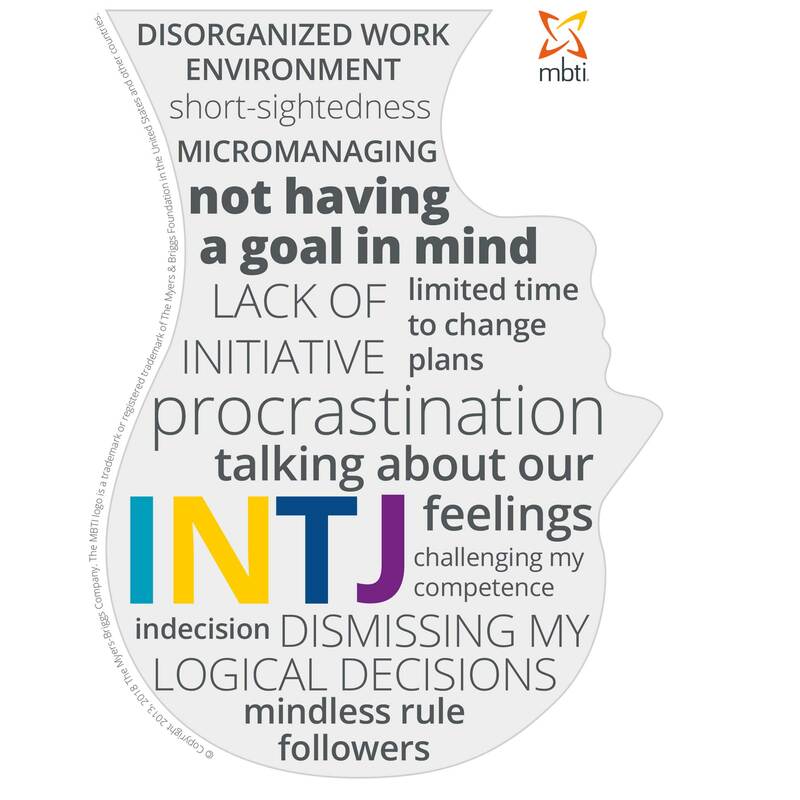 INTJs tend to enjoy being challenged intellectually and working in an environment that is hard-driving and achievement-oriented. They relish the opportunity to work with people who are experts in their field. Appealing careers for INTJs include those in scientific or technical industries such as engineering, computing or law. More insight about INTJ jobs can be found in our Introduction to Type and Careers. An INTJ will typically become stressed in the situations shown in this MBTI type head illustration. In these circumstances you may feel physically stressed and intensely angry, with an obsessive focus on certain details and a tendency to overindulge. Download and share* this INTJ stress head to remind yourself and your colleagues about the things that stress INTJs. An INTJ might find it difficult to engage in social conversations and they tend to be seen as private and reserved. They also might fail to give as much praise or intimate rapport as those around them would desire. Read our blog post on "What if your date is not your type?!"